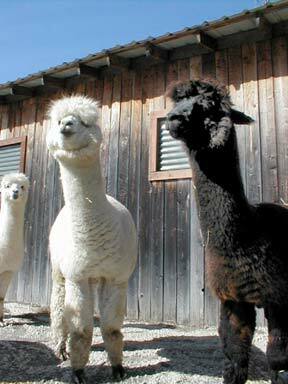 Alpacas, such as these ones from local breeder Eagle Valley Alpacas, are no longer allowed to be imported from South America. Photo by Trish Gannon. A new sort of breed? The Sandpoint area is known for all sorts of animals  wild and domestic  so its not surprising to drive down the road and see, grazing in the fields, alpaca. This unusual looking animal is prized for its gentle temperament, ease of care and earth-friendly lifestyle  not to mention its wool. That wool is part of the reason why three ranches in the Sandpoint area raise them: Eagle Valley Alpacas, Lakeview Fiber Ranch and Snowmass Alpacas. Native to Peru, Bolivia and Chile, alpacas are much smaller than the similar llama, standing only 3 feet at the withers on average. The huacaya alpaca, the predominant U.S. breed, has a dense, thick and crimpy coat that comes in 22 basic colors with dozens of variations. Theyre said to resemble a teddy bear when in full coat. Sheared annually, alpaca wool is classified as a rare, specialty fiber that is five times warmer than sheeps wool and more luxurious than cashmere, and is growing in popularity.